This page gives a picture and a brief description for each episode. The episodes are listed in the order in which they were originally broadcast. Dr. Tezuka designed the show to have an overall story arc; the characters grew and changed over the course of the series. For reference, the episode number assigned by the American syndicator is given (they deliberately scrambled the order of the episodes to hide the progression of the story line). The VHS "Volume" number is also given; these tapes follow the American episode numbering. There are 52 episodes in all. If an episode title is clickable, that means there is more available for that show, like more pictures or even manga adaptations. The white lion Caesar has begun the creation of a peaceful animal kingdom. His mistake is that he angers the nearby humans, and a hunter, Viper Snakely, is hired to dispose of him. Snakely finally succeeds, also capturing Caesar's widow, Snowene, whom he plans to sell to a zoo. On an ocean boat, in a cage, a baby white lion is born to Snowene. 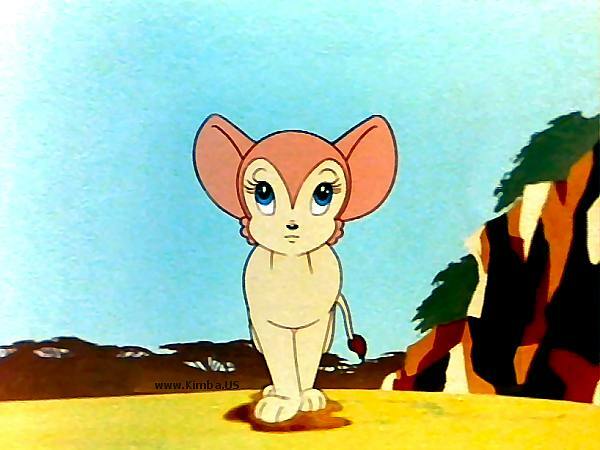 It is Kimba. Kimba's mother tells him he must jump from the ship and return to the jungle to carry on for his father. The young cub reluctantly obeys and dives into the ocean. Birds, fish, and butterflies each contribute in their own way to help Kimba make the journey. This episode has been translated into English three times: once in 1965, once in 1966 (both by Billie Lou Watt and the rest of the Titan Productions cast), and once in 1993 (by Yvonne Murray and the Canadian cast). The first (1965) version is the best, but it was actually discarded and replaced by the 1966 dub. The 1965 version was considered lost, but has recently been restored. Click here for details. Narrator, unnamed animals, Viper Snakely, Tubby, Caesar, unnamed hunters, Snowene, Dan'l Baboon, Game Warden, Jocko, Socko, unnamed rats, Kimba, unnamed stork, unnamed cats, unnamed sailors, unnamed fish, Mr. Tuna, unnamed sawshark, Pauly Cracker, butterflies. Click here for a detailed listing of the cuts made to this episode in the 1966 and 1993 English translations. 2. THE WIND IN THE DESERT. Kimba's return to his father's land seems to be short-lived. He is captured by hunters and gets caught up in an illegal weapons sale and government agents. Along the way he learns that his pacifist ideal must be tempered with the willingness to fight. The American dub of this episode is a bit confused, and has confused some people because they gave the good agent, James Brawn, the same voice as Roger Ranger. The two men are not meant to be the same character. See also the article on the history of Kimba the White Lion. Kimba, Tom (the tall hyena), Bucky Deer, Tab (the fat hyena), James Brawn, Graspin Grab, unnamed men, Dan'l Baboon, Pauly Cracker, unnamed birds, Cassius, unnamed animals, Dodie Deer, Bush Daddy, Claw. Roger and Mary are lost in the jungle after a plane crash, and the animals treat them with suspicion. When Geraldine breaks a leg, Kimba goes to seek these humans' aid for her. He meets Boss Rhino and learns that Rainbow Bridge is ready to collapse. Kimba must find some way to warn the people of the dangerous bridge. He desperately tries to call out in a way they'll understand -- and with great effort he sounds the word "danger." The warning is too late to stop Mary, who is most of the way across when the bridge breaks up. She makes it to the other side, but assumes Roger is lost in the ravine. Roger had seen Mary's position and assumes she made it across safely. He aids the injured giraffe. The animals are all eager to learn to be able to speak with this new friend. Roger Ranger decides to stay in the jungle and teach his new friends all he can. 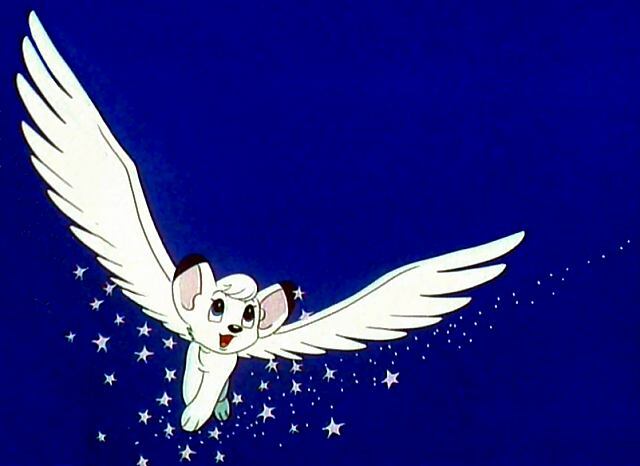 Thus an important link in Kimba's dream --communication-- is set in place. Caesar (as a metaphor), Dan'l Baboon, Bucky Deer, Kimba, Roger Ranger, Mary, Boss Rhino, Cindy, unnamed people, unnamed python, Geraldine Giraffe, Geraldine' mother, Havey Hedgehog. The old ways and the new collide as Samson the water buffalo brings three domestic mules for the predators to eat. Fearing his size and strength, the animals go along with him, leaving Kimba feeling that he has no support. Dan'l Baboon, Bucky, and Pauley Cracker decide Kimba needs some special encouragement. They steal the hide of Kimba's father, Caesar, from the hunters, and pretend to be his ghost. Narrator, Dan'l Baboon, python, Kimba, Samson, Stretch giraffe, Pauly Cracker, Bucky Deer, Chimpy, gorillas, rodents, antelope, elephant, chimpanzees, various animals, mules, Game Warden (Commissioner), Hotshot Hopper, villagers, birds. 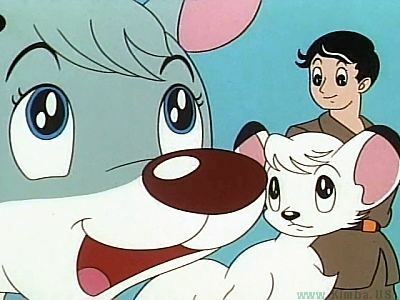 In a flashback, Kimba tells of being with Roger, Mary, & Mr. Pompus in Paris, and meeting Speedy's grandfather, Quasimoto. The episode ends with Kimba's vision of a futuristic paradise. Note: There are two versions of this episode that were produced in 1966. The Right Stuf VHS tape (Volume 12) had the shorter version. The DVDs (both the Rhino set and the Ultra Edition Box Set) have the longer version, which has 1 minute 40 seconds more than the shorter version. Kimba, Mr. Pompus, Mary, Roger Ranger, parisians, Pauly Cracker, Bucky Deer, Geraldine giraffe, antelope, Dodie Deer, Astro Boy, "Speedy Cheetah" (leopard), charladies, Quasimodo, Police Prefect, policemen. The farm is not producing food yet and times are hard. Hedda River Hog is ill and steals reserve supplies of food. Narrator, Dan'l Baboon, Pauley Cracker, Kimba, Bucky Deer, Mrs. Hippo, Tiny Hippo, various unnamed animals, water buffalo (Samson?--his horn is not broken as in episode 4), Stripes and other zebras, wild dogs, Kelly Funt and other elephants, Hedda River Hog, pair of young monkeys, wildcat, pelican. 7. BATTLE AT DEAD RIVER. Kimba first meets Kitty by way of rescuing her from Claw. 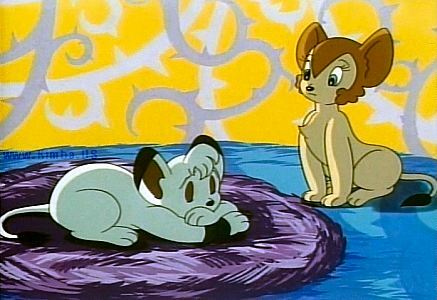 Claw decides it is time to rid himself of Kimba, and sets up a plan to frame him, thus leaving it to the other animals to banish Kimba. Kimba has convinced the meat eating animals to change to vegetables so that the smaller animals can live without fear of being attacked. They have all worked together to create a farm for growing their food. Suddenly, a huge cloud of invading insects sweeps down on them. Valiantly the animals fight to save their crops. Kimba's plan succeeds in capturing the entire invading force, and in so doing creates a new food source for the carnivores. 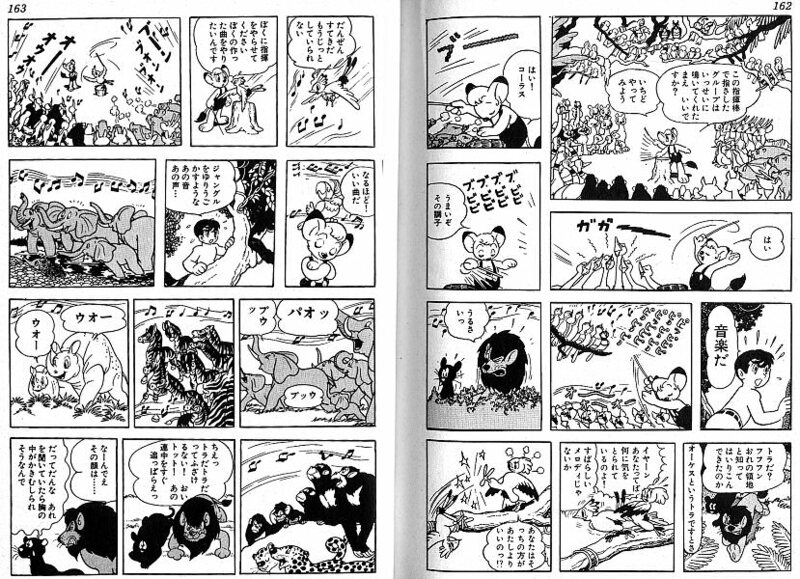 Click here for a detailed description of the changes made to this episode in the 1966 and 1993 English translations. Professor Madcap incapacitates Clutch Eagle to create a Flyger, which becomes a menace to everyone. 10. TWO HEARTS AND TWO MINDS. 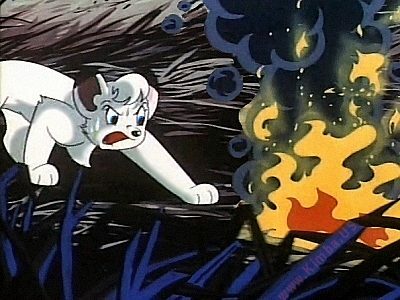 Kimba finds pictures of Kitty that fell from a helicopter and has a dream that she is in danger. In fact, Kitty is endangered by an insane movie director who will stop at nothing for sensationalism. This episode also tells the story of Pauley and Pauline, and of Caesar's and Snowene's first meeting. A bit longer than most episodes (24 minutes). 11. CATCH 'EM IF YOU CAN. Mary's animosity toward animals manifests as an alter-ego, Tonga --maniacal in her treatment of animals and pursuit of Kimba. She brings to Africa three of the greatest hunters in the world: an inventor, a cowboy ("Billy Bully"), and a circus strong man ("Great Gusto"). The defeat of Tonga's imported hunters does not deter her from pursuing Kimba. She sends her pet lioness to trap him. When that ultimately fails, she and her band of hunters invade the jungle in seemingly unstoppable tanks. 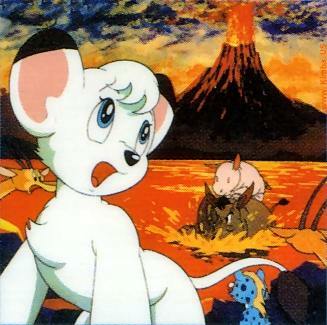 Kimba then learns of the mysterious Mt. Moon and his supernatural benefactor, a mammoth. Snakely and Tubby also survived the shipwreck that killed Kimba's mother and return to Africa under contract to capture a vast number of animals. When they discover Roger and the animals living together, they switch tactics and masquerade as professors studying animal habits. Kimba recognizes the two hunters, but decides that revenge would only bring further retaliation. Click here to see a bit of the manga that inspired this episode. 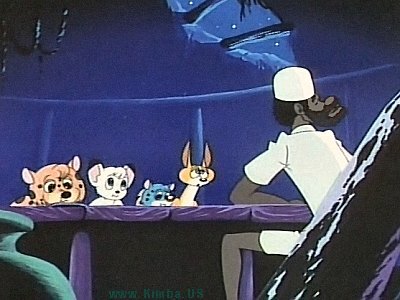 Kimba attends the Lion Convention. King Specklerex, the leader, once knew Caesar, Kimba's father, and was jealous of his wisdom and strength; so he denies that Kimba with his white fur is even a lion and sends him away. 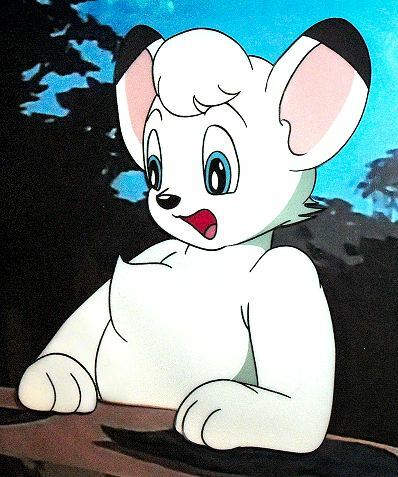 Kimba is plagued with doubts about himself and why he is white. Roger Ranger does some research and tells Kimba about his ancestors. It's spring cleaning day, and all the birds' eggs are gathered together to keep them safe. No one has informed Speedy of this, and, not knowing what they are, he dumps them in the river. Click here to see what was cut from the 1966 English version. 16. DIAMONDS IN THE GRUFF. 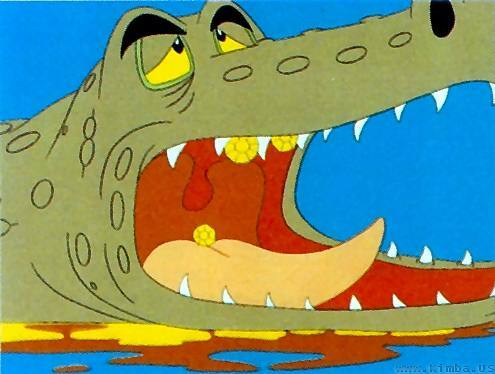 Alligators eat a cache of stolen diamonds and hold some of the animals hostage. Kimba and Roger team up to save them, while the diamond thieves close in. Rancid Reekybird is ostracized by all the animals because of his smell, which comes from the kinds of plants he eats. It turns out that his stench is also strong enough to break the hypnotic spell of a giant snake. Gargoyle G. Warthog has a severe case of low self-esteem, and ends up taking on Howler and his gang of troublemaking baboons to prove himself. The scene in which Gargoyle is beat up by the baboons was shortened for the American version of the show. It was pretty brutal in the original version. You can see the original version on the Extras disc in the Kimba Ultra Edition DVD box set. 19. THE MYSTERY OF THE DESERTED VILLAGE. 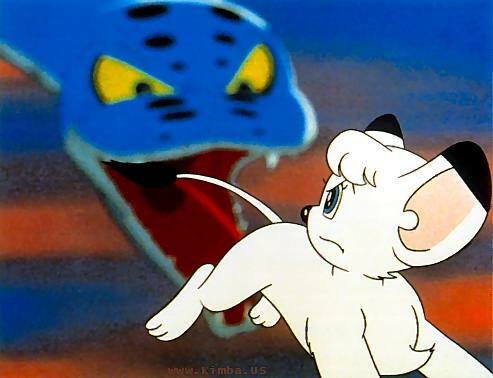 Claw lures Kimba to a deserted village on a pretext. Speedy tags along, but Claw injures him. He is found and cared for by some wealthy humans who are in Africa on a luxury safari. Kimba meets his sister Leona for the first time at a shrine in the deserted village where she's been protecting the ancestral hides of the white lions. Because the animals fight over food, Kimba suggests starting a restaurant. Dan'l and Pauley can't agree on how to do this, so they start competing restaurants. The elephants and rhinos take a dim view of this imiation of the human world. Big-O, another mandrill who had been beaten by Dan'l many years before, returns to get his revenge. Kimba tries to stop the battle because Dan'l Baboon is now too old. Big-O vows to wipe out all the animals in Kimba's kingdom so that he can take over. He uses his monkey minions to make a pipeline of hollow trees that will carry deadly sulfur gas into the jungle. An epidemic of Stony Mountain Spotted Fever threatens to wipe out the jungle population. Pop Wooly, an old mountain sheep, knows the location of the one source of a cure, accessible only to one as sure-footed as he. When Pop Wooly contracts the same disease, Kimba must make the trip himself. The scene in which Kimba fights the lizards was shortened for the American version of the show, presumably because the end of the scene was a bit scary. You can see the original version on the Extras disc in the Kimba Ultra Edition DVD box set. Underground radiation has caused a giant mutant grasshopper to appear in the underground cave where Kimba trapped the swarm. Kimba does not want to take any life, but realizes that this one will cause the death of many others unless stopped. The animals decide to build a monument to the history of the white lions, and this is more than Claw can stand. Cassius threatens the old owl Gypsy to get her to use one of her magic potions against Kimba. 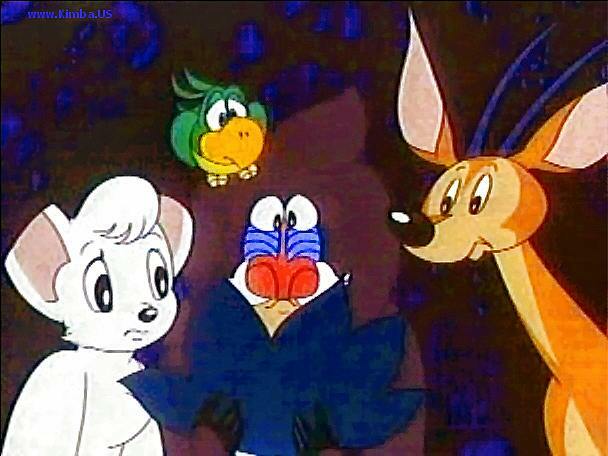 Seeing the devotion the other animals have to Kimba leads her to trick Tom and Tab into giving Kimba the antidote. Mr. Pompus attempts to get Roger to leave jungle. Meanwhile, Kimba tries to save an elephant herd from slaughter because it has been decided that there are too many elephants in that area. The carnivores revolt against eating only vegetables and insects. Claw teaches the young ones to enjoy the taste of meat. Meanwhile, a scientist turns up in the jungle looking for a plant to provide the ingredient necessary to complete his synthetic meat product. 27. THE CHAMELEON WHO CRIED WOLF. Newton the chameleon is a compulsive liar. All the animals become completely disgusted and refuse to believe anything Newton tells them. Naturally, when he tells them that Kimba is fighting off an attack of vicious wolves, they refuse to go and help. Wiley Wildcat is out to cause havoc everywhere. Kimba comes up with the idea that Wiley needs someone like himself to get through to him, so Kimba joins him in his rampages. One night Kimba overhears Wiley talking in his sleep about his mother being killed by hunters. This has embittered him toward everyone else. A mad scientist develops a plant with psychoactive power, causing the animals to have violent nightmares which result in serious fights among themselves. 30. ADVENTURE IN THE CITY. 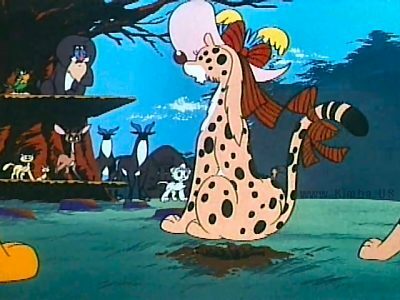 Kitty's Uncle Specklerex visits and accuses Kimba of forgetting his wild heritage and becoming soft. Kimba decides to humor him, but when Specklerex discovers this, he leaves. On his way he discovers a human and pursues him to a city. This results in him causing confusion and getting confused --he ends up challenging a train to a fight. Kimba and Kitty try to rescue him. Kimba sets out to rescue Tom and Tab from Twin Skull Cave, which turns out to hold an ancient city of gold. Two gold hunters have also discovered this fact. Seymour Hart is a ranger in a game reserve, battling poachers that attack the animals for profit. 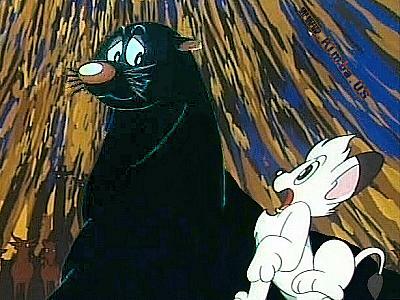 Kimba saves Seymour after he is badly wounded. The animals join the ranger in tracking down the leader of the gang of outlaw hunters, called The Devil Man. 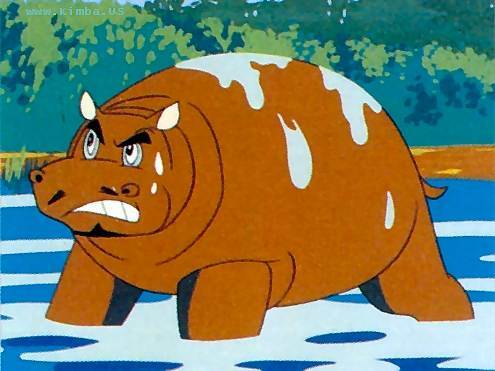 When Harold Heron disappears during a storm, his mother suspects foul play and accuses Clunker, the hippopotamus who has been throwing his weight around. His actions lead the animals to presume him guilty, which makes it tough when Kimba declares he must be given a fair trial. Claw has vowed revenge because Kimba is turning that lion's hunting ground into an amusement park. After a fight, Claw tosses out Cassius and the hyenas and Kimba accepts them as part of his jungle. Note: The American dubbers did not want a 2-part story, so they cut out the last shots, showing how Claw had the rollercoaster sabotaged and Kimba getting seriously hurt. These shots can be seen at the beginning of the next episode, The Pretenders. The end of this episode was cut off for the American version of the show, so that it would not appear to be part 1 of a 2-part story. You can see the original ending on the Extras disc in the Kimba Ultra Edition DVD box set. Cassius and the hyenas work hard to improve the amusement park. They even build a theater and put on a revue. 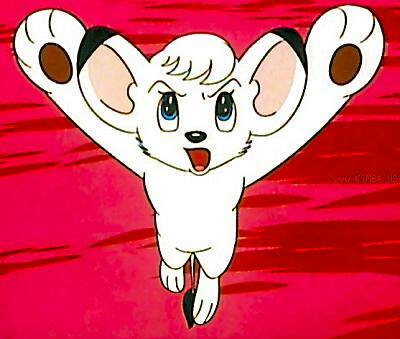 The purpose of the show, however, is to cause the other animals to rebel against Kimba. When their scheme is discovered, they hold Kitty hostage. An entire song was cut out of this episode by the Americans, along with some very surrealistic animation. You can see the cut portion in RealVideo format here, or in full quality with subtitles on the Extras disc in the Kimba Ultra Edition DVD box set. 36. THE MONSTER OF PETRIFIED VALLEY. Kimba discovers Colosso, the last survivor of a race of giant birds, after rescuing Charlie and Harley Cheetah from Petrified Valley. Colosso is invited to Kimba's jungle but can't fit in. 37. LEGEND OF HIPPO VALLEY. An ancient well has a message for everyone, from ancient human history to the current hippopotamuses who claim it... while the animals' farm is in desperate need of water during the current drought. The young animals are playing on Volcano Island when they're confronted by Boss Rhino who wants the privacy of the island for his cousin and his missus while she delivers her baby. The volcano picks this time to become active again, and the rush to get everyone to safety begins. The fight scene between Kimba and Boss Rhino was shortened for the American version of the show. You can see the original version on the Extras disc in the Kimba Ultra Edition DVD box set. A massive antelope stampede threatens not only the animals involved, but the farm as well. Kimba aims to save both the farm and the stampeding animals. Benny Ostrich is not only a chronic liar, but he has decided he wants to be with Kimba all the time, which angers his dangerous old uncle. 41. DESTROYERS FROM THE DESERT. At sunset, the Devil Wind crosses the sun, signalling the arrival of the three Destroyers. They severely injure Kimba and take over the jungle. Dan'l nurses Kimba back to health with the idea that they should leave the area to the destroyers, but Pauley comes up with tactics to help Kimba win. 42. THE BALLOON THAT BLOWS UP. When Kimba finds Dot, Dash and Dinky playing on a "thing made by humans", his curiosity causes him to climb aboard too. Soon the hot air balloon is flying free. Not knowing that there is a bomb attached (belonging to a group of rebel soldiers), they enjoy their flight over Africa. They crash into a hut belonging to an old man ("Jeroboam"). While helping to rebuild his house, they learn that he is trying to maintain his farm until his grandson, who has joined the rebel soldiers, returns. 43. MONSTER OF THE MOUNTAIN. A "chimera" from the Atlas Mountains is terrifying a peaceful little village by appearing in the middle of the night and stealing cattle. Kimba is called for aid; the monster turns out to be a bear and her cub. 44. A FRIEND IN DEED. Roger seeks permission to cross an area jealously guarded by the elephants, and they hold him captive. 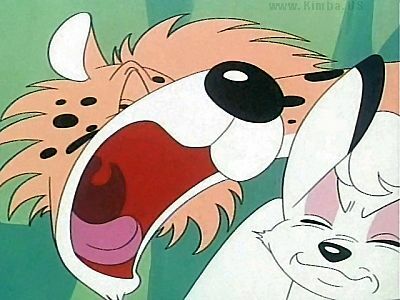 Kelly Funt forces Kimba and others into an endurance test before he will free Roger. During this time, Kimba tells how he first met Roger. Roger Ranger's Uncle Pompus again catches up with his nephew and tries to talk him into returning to civilization. But this coincides with Tonga's return. The escalated warfare is finally over when the mammoth appears again and Tonga is restored to her senses. Roger decides to leave the jungle. 46. THE RETURN OF FANCY PRANCY. Speedy Cheetah's sister is returned to the jungle after a year as a pet. This causes a surprising amount of disruption in everyone's lives. A giant spider threatens all the animals. When Kimba is incapacitated by fever from an insect bite, Dan'l gets the inspiration to defeat the spider. Wildfires in the surrounding area leave a herd of elephants without food. Kimba brings them to his jungle, where the resident elephants resent sharing their food. Kelly Funt imprisons Kimba in an old tower, which becomes the inspiration for protecting their own jungle from the encroaching fire. Dan'l receives a message from his old great great grand-uncle Scratch who wants help to save the oldest and tallest tree in the world, the "sun tree". Muffy, a young cousin of Dan'l's, resents their intrusion, because he's convinced the tree will die and wants all the animals living in it to save themselves by moving to a new home. Despite Kimba's and the animals' efforts, a storm blows over the old sun tree. But Kimba learns that life will renew itself. The animals find a creature like they've never seen before: Floppo, a seal, who is off to see the world. Kimba wants to accompany Floppo on his travels; Dan'l arranges for a party of Pauley, Boss Rhino, and Dodie to accompany them to the seal's current destination: the Indian Ocean. 51. THE DAY THE SUN WENT OUT. Kimba's sister Leona realizes that a storm might destroy the hides of their ancestors that she's been protecting, so she asks for Kimba's aid in moving them to another shrine. During the move Kimba, Leona, and some helpful okapi are knocked into a river by four black leopards and Kimba tells them to save themselves and forget the hides. Leona is furious when she learns some of the hides are lost and tells Kimba to leave, which he does. Everyone tells Kimba he is wrong for leaving her. There is an eclipse, which reminds Boss Rhino of an old superstition: "You'll betray someone you love before the eclipse is done." Kimba decides to return to Leona and saves her and the hides from the four leopards. On the run from hunters, Silvertail, the old lion, stumbles into Kimba's jungle. Kimba and Dan'l decide that if he promises not to attack weaker animals, they will hide him. 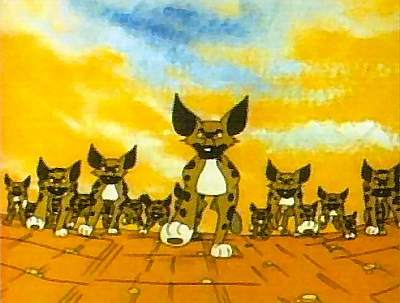 The hunters find him anyway, and Kimba must confront them, making a deal that the animals will prevent Silvertail from returning to the humans' area if the humans will leave. Page updated 17 March 2010.